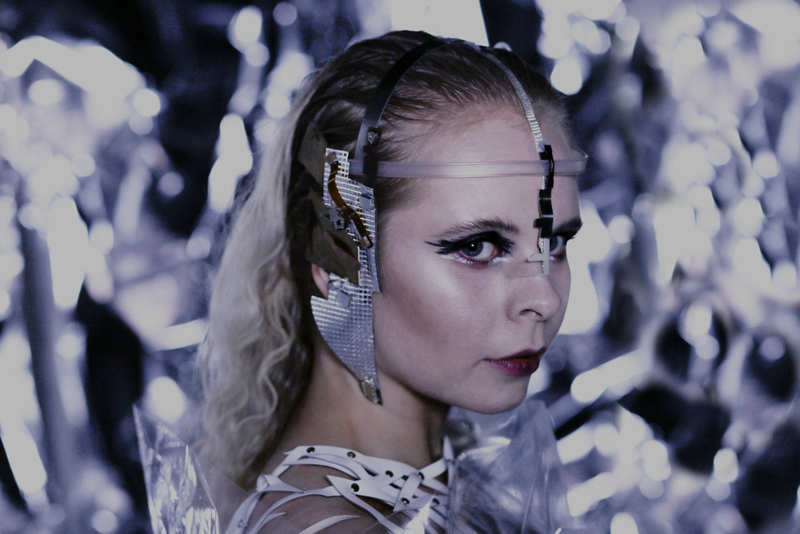 Last Friday, the video for Skin by KRÍA has been released. It is the first video of the entire series that aims to promote a brand new EP from KRÍA entitled ALTAKA. The music written by the vocalist, composer and producer Elísa Hildur Einarsdóttir can be described as dark downtempo electronica. The video for the newest single was directed by Jamie Phelps and Amber Scarlett. Skin was born out of frustration. It was sort of reinventing KRÍA´s values, what she wants from life and kind of accepting herself physically and mentally. Last year Elísa didn’t know if things were going to end well for her and at that time everything was really unclear about her future. So the lyrics are an internal dialogue about facing yourself and your mistakes to accept the person you are and your fate. On the occassion of the premiere of her newest video, KRÍA introduced her project to the readers of Muzyka Islandzka in a few words. Nature, Icelandic folk tales, supernatural happenings but also feminism and vulnerability – those were your inspirations for Low Hype. What has had impact on you while working on the new material that we will hear on ALTAKA EP? Sonically, I drew inspiration from horror films, time traveling and aliens. Like how I imagine the time traveling would sound like and how aliens would sound like. The material is more selfish than on Low Hype, the lyrics are about how I was dealing with myself at the moment. Not even a full year has passed since you released the debut EP Low Hype and you are ready to introduce a sophomore EP with 4 original compositions. Seems like all your songs are actually audio-visual pieces. Why is it so important to you to express yourself through many kinds of art at the same time? Yeah, I think for me it’s about giving the audience a better understanding of how I visualise the song in my head. To understand the meaning behind it, sometimes it might be cryptic but that’s how I want it to be portrayed. What do you find the most important in music? You started playing piano as a child. How did your transition to the synthetic sound look like? While working on the previous recording you collaborated with Icelandic photographer GróaSig. Did you know each other before? Whom have you invited to work on visual side of your material this time? No, we didn’t know each other before. We went to the same college though but never knew each other. Then I saw her Instagram while living in London and wanted to work with her and before I knew it she had messaged me on Facebook. and I couldn’t be happier about our collaboration. But this time I’m working with several people. On the video for Skin I worked with a film maker and a photographer called Jamie Phelps. He’s really talented and an amazing, driven guy to work with. What drives you while making a choice of working together? Do you have your own vision and your collaborators let you express it in the best way or is it rather looking for inspiration from each other? I’m really specific when it comes to visuals in terms of editing and the overall theme. During the collaboration with GróaSig I had my vision for each song but that what made us want to work together was each other’s art. And when we were planning the visuals, there was a mutual understanding of what we both liked and didn’t like. But the outcome was something that we are really proud of. On Low Hype these visuals are more simple than the ones that are coming out now. So on the ALTAKA videos I have worked with others to develop my ideas. From perspective of an artist and musician what makes the London music scene better than the Icelandic one? I don’t know if it’s any better. Iceland has a closer, smaller community. London has one of the biggest music scenes in the world but what made me want to live here was the electronic music scene.